A NTP Clock is a networked device that uses the NTP protocol to provide a consistently accurate display of time. NTP wall clocks have LED digital displays, but are available with traditional analog clock faces. Accurate time is obtained from an Internet or local NTP server. The clocks have an Ethernet network connection, usually RJ45, and are often PoE enabled. Networked time displays are also often referred to as network clocks, IP clocks or PoE clocks. NTP clocks provide an organization-wide display of accurate, synchronized, time. In every location that an clock is installed, users have instant access to a reliably accurate time display. Cost savings are achieved by meetings and classes starting on schedule. Also, events can be logged with an accurate time stamp. Networked clock systems are entirely maintenance free. No operator intervention is required to correct time or adjust for daylight saving time changes. Additionally, all clocks can be managed from a single point. There is no requirement to physically configure each clock individually. IP clocks have very flexible configuration options. They can display 12 or 24 hour time formats. They can also be configured for different time zones. If required, they can even be configured to display the local time of different countries. There are a vast number of applications for synchronized time displays. They can be used anywhere that a reliably accurate display of time is required. Many applications require legally traceable time, which can be provided by network clocks synchronized to a known time reference. Schools – Clocks distributed throughout a school will ensure that classes start and finish on time. Hospitals – Ensure scheduled treatment starts on time and that important events are accurately logged. Policing – Clocks located in interview rooms provide a legally traceable time display. Security – Areas monitored by CCTV cameras provide legally traceable time. Pharmaceuticals – Accurately log the time of important events. Manufacturing – Staff having access to accurate time allows shifts to start and end on-time. Manufacturing processes can also be accurately synchronized. Networked clock systems are also ideal for time and attendance and access control systems. Traditionally, clock systems consisted of a master clock with slave clocks synchronized by an electronic pulse. Such systems required bespoke cabling and expensive master clocks. Network clocks can use existing CAT5 cabling. Additionally, no master clock is required, an internet or local NTP server can be used. 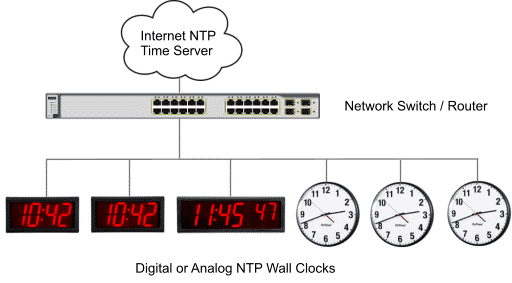 What is Network Time Protocol (NTP)? Network Time Protocol (NTP) is an internet protocol that dates back to the 1980’s. It is a standard protocol for distributing time around a computer network. The protocol is widely used to synchronize the time of servers, workstations and network infrastructure. NTP is a client-server protocol. Any device that utilizes the NTP protocol can obtain accurate time from a NTP server. There are a large number of NTP servers available on the Internet. Most provide an accurate source of time that is accessible completely free of charge. All that is required is an NTP enabled device and access to the internet. Internet NTP servers do have a couple of disadvantages. Firstly, access requires an Internet connection. Secondly, a port must be left open in any firewall, which may have security implications. Also, Internet NTP servers provide no guarantee of service, they can be taken offline at any time. A local dedicated NTP server provides a more reliable solution. A local time server is a hardware device that can obtain accurate time from a Global Navigation Satellite System (GNSS), such as GPS or Galileo, and maintain time internally. The device provides a timing reference to any NTP enabled equipment on a network. Windows servers can be configured to act as NTP servers. This can be particularly useful in time and attendance systems where synchronization is required between time displays, clocking machines and the server logging the transactions. Network clocks are installed on an IP network. They have a network connector, generally RJ45, at the rear of the device. Because they use standard Ethernet networking technology, they can be used with existing network infrastructure. 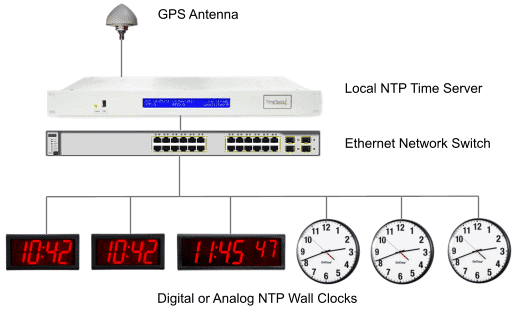 Off-the-shelf routers, switches, media converters and cabling can all be used to install NTP clocks. Many clocks also utilize Power-over-Ethernet. PoE clocks allow both data and power to be provided over a single cable. PoE clocks utilize Power-over-Ethernet components to simplify the installation process. Both data and power is provided over a single CAT5 cable. Cost-savings are achieved because mains power outlets do not need to be installed near to the location of the powered device. Power is provided to the clock from a PoE enabled network hub or switch. Alternatively, a standard switch can be used in conjunction with a PoE injector. PoE is an industrial standard, many network devices, such as IP phones and cameras utilize it. Off the shelf commercial switches often provide PoE enabled network ports. Most NTP clocks allow time zone offsets to be specified, which allows the clock to display local time. Time zone offsets are generally applied to each clock individually. Installed clocks can therefore all show the same local time or you can configure them to display different time zones. Daylight Saving Time changes are also configured in each clock. So that when daylight saving comes into effect, any adjustment is fully automatic. No operator intervention is required. Clocks can be configured from a single location, usually a PC on the same network segment. Configuration is carried out from a password protected telnet session. A number of commands can be used for configuration. Typically, commands set host NTP server, time zone and daylight saving rules. Also network configuration commands allow network settings, such as IP addresses, to be specified. Some feature, DHCP configuration, which allows many clocks to be configured at the same time. NTP clocks usually have a digital display of time, showing hours, minutes and optionally seconds. However, clocks can be provided with standard analog clock faces. Console clocks have smaller displays for installing into a control panel. NTP wall clocks are much larger with digit heights of either 4 inches (100mm) or 7 inches (180mm). Larger sized digits allow longer viewing distances. However, larger display sizes are often much more expensive. Often, it can be more cost-effective to install more smaller clocks than one larger clock. TimeTools has a range of 4-digit, 6-digit and analog NTP clocks. All our clocks are PoE enabled for ease of installation. Contact TimeTools for more details.